To ensure your application for a new domain is as successful as it can be the choice of approved registrar must be carried out with care, and the eligibility rules are followed diligently. 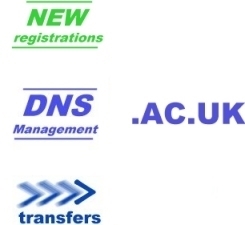 Find out why you should choose us and why you should choose a .ac.uk domain name. this information provided should include details of funding, the primary objectives and status of the requesting organisation as well as the level of courses provided, or in the case of projects, the longevity of confirmed funding. We are an approved Janet registrar and will help you successfully register your new domain. Check the domain availability of a new ac.uk domain.